The newest issue of Public Historian came to my mailbox this afternoon, and it's a treat--a special issue on "Disability and the Practice of Public History." Authors in the theme section include (besides myself): Katherine Ott, Steven Noll, Donna F. Ryan, Robert McRuer, Susan Burch, Catherine Kudlick, Sally Stein, and Timothy Crumrin. Topics include oral history, museum accessibility, the politics of the FDR memorial, the AIDS Quilt project, and reviews of exhibits. Lots of illustrations too. A big welcome for Ragged Edge editor Mary Johnson's entry into the blogging world, Edge-Centric, which debuted just this week and is already a daily must-read for me. Not here--we've still got a week of summer school to go. But if there are teachers or parents out there shopping for craft supplies and frustrated not to be finding kid-friendly inclusive images, a friend tipped me to Same Differences, a New Jersey-based scrapbooking company (owned by PWD Kim Luty) that makes stickers and such that feature a wider diversity of characters--older folks, people using wheelchairs, a service dog, etc. Here's an example from their site (right; click on it for a closer look). Maybe I'll make a packet of such supplies for first-day-of-school teacher gifts ...along with sending my son in his new Nth Degree "boing" t-shirt, of course. Kestrell, aka The Blind Bookworm, has been posting to her LiveJournal about her adventures testing technology this summer. On July 13, she describes testing a multimedia e-book about mathematics being produced by WGBH, and on July 15 she describes a "a wearable haptic braille display" she tested at MIT's Media Lab, which will maybe eventually need a better name, but otherwise sounds cool. A forum on the film Million Dollar Baby has been published in Disability Studies Quarterly(DSQ), flagship journal of the Society for Disability Studies. Due to special arrangements, this section is available for public access. Although DSQ has recently become a password-protected online journal available only to subscribers and members of the society, the editors have opted to allow open access to the Summer 2005 Million Dollar Baby forum in conjunction with the film’s release on DVD/video. The forum includes commentary from a wide variety of contributors on the film and its relationship to activism, media, and the response of the disability/disability studies community. ongoing drive for public awareness and corporate responsibility. visitable by people with mobility impairments. transportation, are excellent for older people who can no longer drive. trend, and younger disabled people are surviving longer than ever before. reading: "Nostalgic Front Stoop. Please step over." New Glenwood Park home with lots of steps. would be held up as a model for years to come. "Basic Access to Every New Home: One zero-step entrance, 32-inch doors!" and Georgia Voices That Count. pledged to hold a training of their builders. what actually occurs in practice as the next houses go up. Eleanor Smith is the founder of Concrete Change. Thanks to my father Dr. C. Richard Dorn for drawing my attention to this article from last weekend's Columbus (Ohio) Dispatch. Doctoral students at Wright State University will be able to concentrate on technology-based methods for teaching disabled students, thanks to a $3 million National Science Foundation grant. A team of more than 20 faculty members will create the concentration during the five- year grant. Research under the program will center on how to create experiences for the disabled that allow them to overcome obstacles in their lives and learning. The new concentration will operate through one of four Ph.D. programs at the Dayton school. Diversity Inc is planning a feature story for the October magazine issue about diversity within the disability community. We're looking for people of color and GLBT individuals with disabilities to talk about their experiences. If you're interested in participating, please send your name, phone number, disability and race, ethnicity and/or sexual orientation via email to editor@diversityinc.com by July 15. 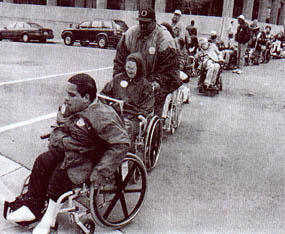 How are you celebrating the 15th anniversary of the signing of the ADA in July 1990? We went to one of the many events in the Los Angeles area today--at Kidspace Children's Museum in Pasadena. An all-day schedule of events, from dance troupes to art projects to the Fast Breakin' Lakers (a men's wheelchair basketball team, formerly the Los Angeles Stars), and information booths from community organizations serving families and kids with disabilities. It was too bright outside, but the usual indoor activities at the Playspace were fun too. A press release from Scholastic today says that, in conjunction with the National Braille Press, they plan to release a Braille edition of the newest Harry Potter book within a week of its July 16 printed text release. This is a big improvement over the lag time of months or even years that many popular novels take in getting a Braille edition, and a sign that someone has noticed how kids' reading culture works--reading an OLD HP book isn't any fun when your friends are all reading the latest. (On the other hand: the Braille edition will be a nine-volume, eleven-pound stack of books, requiring more than a foot of shelf space--hardly backpack material.) For Potter fans who don't read printed text or Braille, there will be an unabridged audio version recorded by volunteers in a marathon session ON July 16; that should be available within the week as well. On Cliopatria, Jonathan Dresner mentions his wife Anna Dresner's new book for the National Braille Press, guiding blind users through the iPod Shuffle. The Shuffle is the only device in the iPod line that doesn't have a menu screen, which is a good start--but there's still the challenge of navigating the iTunes music store, and using iTunes to get your music onto your iPod. Her next project is about podcasting and blind culture--Jonathan explains some of that too, then goes into a concluding paragraph about the general issue of technological lags as experienced by various segments of society.